I liked the Burrito Bowl I made the other day so much I did it again for dinner. And this time, I added the one element I'd missed out the last time - a roasted corn salsa. Like the previous Chipotle-like recipes, credit for this lovely salad goes to ChipotleFan. Corn Salsa's as easy to put together as it is delicious. You roast a couple of ears of corn - I did it on an open stove flame, but find a grill if that makes you feel better. Let them cool, then cut the corn off the cob. Mix the corn with a chopped onion, a couple of chopped jalepenos, a handful of cilantro, salt, pepper and juice of a lime. While this surely goes very well with the rest of the elements in the burrito bowl, I had leftovers that I then mixed with some steamed wild rice. An equally pleasant combination. 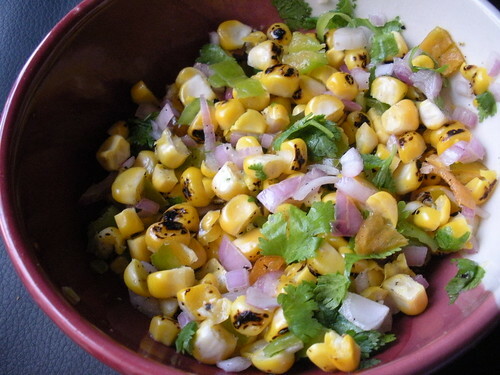 Lovely grilled corn salsa.Healthy and delicious too.